The box is really huge and is packed with a lot of stuff. In fact everything you need to play through the first missions (2 players), which are provided in the "Operation Damocles" rule book. The miniatures look more than great and are of good quality, from my point of view the prepainting is really satisfying - saving a lot of time, which can be used for playing instead. Beside containers, concrecte walls and generators, also a battle map, dice and even a tape measure is included. The rules are introduced to the players step by step through the six missions of "Operation Damocles", covering the standard topics in miniatures gaming like movement, fighting, line-of-sight, damage and so on. They are simple and straight-forward, although enabling strategic battles - nevertheless I'm sure that the full rules will offer even more depth. The game plays fast and it is a lot of fun to control your squads and combat walkers (be it the Therians or UNA soldiers), and try to defeat your opponent in exciting battles - using concrete walls or containers as cover or try to destroy generators according to the respective scenario and its goals. The Initiation Set "Operation Damocles" is a fine introduction to the universe of AT-43 and to miniatures gaming in general, as it is not only easy accessible for new players, but also comes with prepainted miniatures and simple rules. I'm really up for the full rules and for additional units (maybe I will write about them here soon) to expand the scenarios and battles, and increase the fun and tension when fighting bigger armies. AT-43 definitely has the potential to become the Sci-Fi miniatures game of choice for me. Anyway, thumbs up for Rackham and AT-43! AT-43 is a science fiction strategy game played with miniatures. The game could be assimilated to a blend of chess, for its tactical side, and poker, for its luck and bluff components. The game was designed to fulfill the expectations of the most experienced players but also to initiate the beginners who wish to discover the fun of playing out thrilling futuristic battles with a game that is easy to learn and ready to play. In fact, all AT-43 miniatures are sold assembled and painted. This way it is possible to appreciate the finesse and beauty of the miniatures, while diving immediately into the game’s universe. AT-43® is an intense, fast paced and captivating game, staging exceptional miniatures for immediate immersion into the inferno of battles. 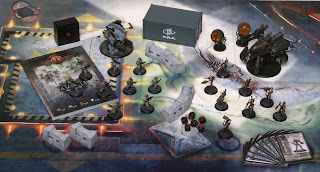 The Initiation Set: Operation Damocles box is there to help the new players get started as they learn the game progressively. Operation Damocles is a complete two player game, ideal to begin and discover science-fiction miniatures game.